Start by taking a small rigging needle. FIRST, dull the end of the needle to a bullnose with a file then a sharpening stone. Make the end round & polished so as not to snag the bait fish's eye when threading the needle above the eyeball and below the skull. Next, take Dental TAPE (heavier than flooss) or heavy waxed thread available at many tackle stores, and pull around 11" of thread through the needle doubling it back around 1". Twist the needle to make the 10" length and the 1" length combine. Next - slide the needle above one eye, following the bottom of the skull and come out the other side above the eyeball and below the skull. Pull all but around 5" of the line through the fish leaving equal amounts of line on each side. Slide the needle off of the line and set it down. Next, tie a double overhand knot on top of the fish's head. Then tie another double overhand knot securing a tight loop around the skull of the fish. Then take the remaining line and tie a double overhand knot around 1.5" - 2" up from the fishes head to make a "safety link". To attach your bait to your hook, slide the hooks barb through the safety link and wrap the link around the hook three times, then slide (from the front) the point/barb between the fish and the tight loop with the point facing upwards. 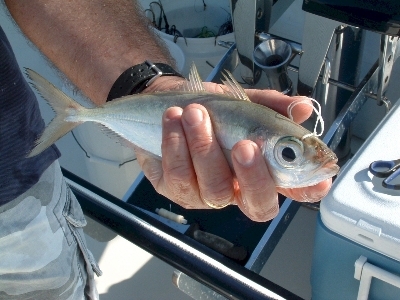 Deploy your bait whether straight from the rod tip, off a down rigger, outrigger, or kite.